The various auto and auto related policies have and are being touted as the lifelines required to resuscitate the auto industry. It however seems that the lines have caught the industry round the neck and are slowly, but surely, strangling it. Development of the auto industry needs to be addressed across the whole value chain – the new, the used, the fake, the unregulated and everything in between. The Hon. Minister of Trade and Investment, Dr Okey Enelamah, has acknowledged that implementation of the auto policy has been poor and called on the private sector to join in the implementation. I however believe that a review of the policy is required before implementation. This is not a time issue, so we shouldn’t mark success to how soon it can be signed into law. It is just as important that the document represents the interests of the whole industry. Nb – a review might not make fundamental changes, but it should allow input from all affected parties. Indeed, the policy guidelines provide for periodic review and since the fundamentals in 2013 have significantly changed, it’s a no brainer. The duty rates in the policy have not been realistically set and are not transparently implemented. Used car dealers are being charged 35%, whilst new car dealers facing a 35% duty + 35% levy charge. I understand the rationale – that the assemblers need to be protected from those who are merely trading. However, in the process, it is killing even the assemblers, since their production is stagnated and the used cars are being imported anyway. Lowering of the current duty rates in a controlled manner could actually be a good thing – high duty with poor border control (and Benin Republic next door) is double wahala for the government – imports and duty fall while smuggling increases. The current implementation committee of the auto policy needs to include the used car dealers that comprise 80% of the industry. It also needs to include the auto mechanics, the spare parts manufacturers and the transport owners. Admittedly, we cannot continue the used car trend, especially if vehicle assembly is to thrive and when combustion engines are being phased out. There are environmental issues and technological reasons too, as more countries turn out hybrid vehicles. The policy must therefore accommodate the 21,000 used car dealers and support their evolution into new car dealers that can support the 400,000+ vehicles that will be assembled. There needs to be a structured phase out – maybe a change in regulation and fiscal enforcement. We need to effect a deliberate reduction in the age of imported used cars from the present 15yrs to say, 5yrs over the next 3 or 4 years to give dealers time to evolve to newer cars and such dealers should be supported with a program of supervised training, financial access, IT upgrade, forecourt development and proper. This could be backed by a mileage restriction or premium duty for older vehicles. All vehicle dealers, especially the used vehicle dealers, need to be identified and registered. If the industry is to grow, it needs to be regulated. Private imports might need to be stopped (or such vehicle held for 1 year before resale, in order to curtail further unregulated transactions), or all imports go throughregistered dealers. These registered dealers should then benefit from a range of development initiativesto position themselves to become dealers for the 54 licenced assemblers and 400,000+ vehicles in addition to the current inventory of used vehicles. We must consider schemes for individuals to exchange old cars for new ones (scrappage if necessary), like UK did for emissions reduction. Government will acquire and scrap vehicles of a particular age or make for environmental or mechanical reasons. The owner (with proof of ownership), will receive a voucher that can be used in part payment with one of the registered dealers for a Nigerian assembled vehicle – supported with finance from the Auto bank. This will remove defective vehicles from the roads and encourage replacement of old vehicles – which in turn will act as a catalyst as the assemblers scale up production. We will also need to scale down and eventually ban the importation of used vehicle parts – possibly over the same period to scale down the age of imported used vehicles. we should then support the development of SMEs as component manufacturers and subsequently ban car parts once the quality and standard meet those of the OEMs. Time for an auto bank? In the same vein as a bank of Agriculture, SME Development etc. we should now consider an Auto Bank. We have the market and we have the need – look at the winners of the “best customer” for the auto industry awards, and you will find the Vehicle and Asset Finance Departments of banks, who acquire the vehicles from the dealers and sell on HP to the user, retaining ownership until final payment. The bank will seek and deploy funds that will support the auto industry across the value chain to acquire and replace up to 5millionvehicles (I commented on this in Part 1 of this write-up). The Auto bank can take seed capital from the National Automotive Fund domiciled in the BOI and source funds from the Sovereign wealth fund and the capital market. Additional support should be sought from OEMs and IDAs (World Bank, AfDBetc.). An Auto Bank financing will target single digit interest, repayment terms up to 4 years, deposits as low as 10% of value and a platform for part exchange of old vehicles through dealers.Acquisition/disposal of 200,000 new and used vehicles (including the multiplier effect of lending) and additional income from a voucher scrappage scheme of up to 200,000 vehicles annually will definitely be a catalyst for the industry. The policy needs to protect the auto dealers from the exuberance of the Nigerian Customs Department in the areas of valuation. Customs need to focus on duty calculation and collection, seeking more viable ways to ensure that the valuation presented by the dealers are accurate and legitimate. In addition, NCS needs a change in mind-set that their duty.is collecting duty, not generating revenue. The data repository recently introduced by NADDC is a good attempt at combating smuggling and this will work in collaboration from land border import restrictions. Now the government should consider stopping defective vehicles at point of origin – maybe certification of road worthiness should be from origin. Eventually, we should have an industry where a vehicle is assembled in Nigeria (or a less than 5yr vehicle imported into Nigeria by a registered dealer). The acquisition is financed at a single digit loan from the Auto Bank. The imported vehicle is certified road worthy from country of origin. 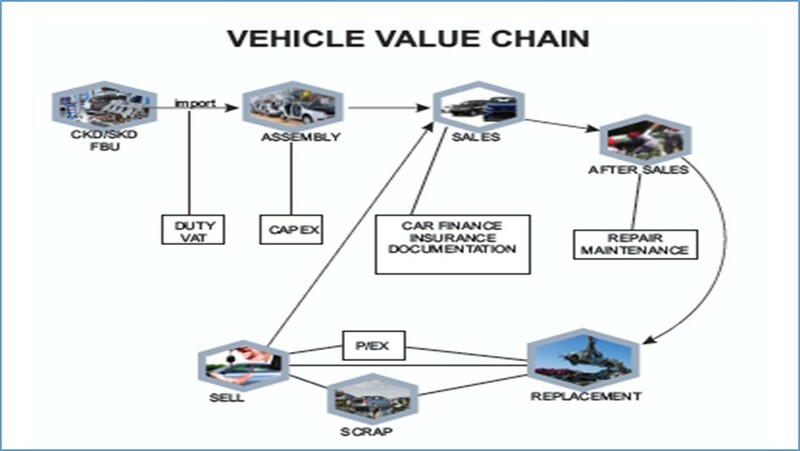 You service your car with parts manufactured in Nigeria, good enough for the OEMsand installed by an accredited auto technician and at end of life, you should be able to trade-in your vehicle as part payment for a newer vehicle and whether new or used, the value chain would have contributed to the development of the economy through duty, taxes or commerce.